NFL 2017 season is upon us and here is everything you need to know to get ready to watch football without the cable box before the it starts. Great news for all cord cutters are that it has never been easier or more convenient to watch the football games for free or near-free and limit commercials to minimum. There is a multitude of choices and we’ll go over them so you can make the informed decision. You can scroll to the bottom of the page to see the full schedule for all regular season games and where they will be shown. Due to licensing for local games antenna is a great starting point of your preparation. All local games will be aired on CBS, FOX and NBC so you need to make sure that your antenna is good enough to pick those up. If you don’t already have an antenna tvfool.com site is a great starting point. It will provide you with the distance and direction of the nearest transmitter based on your exact address. I had a great luck with RCA, ClearStream and Mohu antennas. Your choice will be greatly affected by the distance from the transmitting station. For me RCA ANT751 mounted in an attic was enough to pull all channels over both UHF and VHF from 36+ miles away. Now how do we avoid all the commercials that are aired and only watch the action. What I’ve been doing is starting the recording of the game based on the DVR schedule and not beginning to watch it until at least 30 minutes of it has passed. In order to do that you will need some kind of timeshifting or DVR functionality. By far the best and easiest to use device is the Tivo Roamio OTA. Their SkipMode will allow you to skip the commercial with the one click of the button. Once you try it it will be very hard to go back to the regular DVR. Other DVRs like ChannelMaster, Android TV Live Channels (using Nvidia Shield) and others will work as well but will not be as easy and seamless as the Tivo. I go into detail comparing all OTA DVR systems here, here and here so you can read and make an informed decision. If using an antenna is impossible due to either distance or logistics all major live streaming services now offer CBS, FOX and NBC but actual coverage in your area may vary due to licensing and local affiliates. Every region is different so you’ll need to look into it yourself. As of this writing DirecTV NOW, HULU Live, Playstation Vue, Sling and Youtube TV all offer local channels.I am currently working on the comprehensive comparison for all of those services so stay tuned if you need some help choosing between them. This will cover all of Sunday Football action and leave only Monday Night Football (MNF) and Thursday Night Football (TNF) so let’s go over those games and options for them. Unfortunately options are limited when it comes to Monday Night Football as it is only shown on ESPN. If this is a must for you you will have to sign up for one of the streaming services. 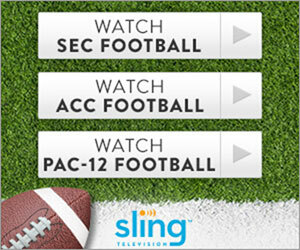 Sling TV Orange ($20/mo) is currently the most affordable option but others might be a better fit depending on what features (DVR) and channels you need. It gets a little more complicated when it comes to the Thursday Night Football games. This year Amazon picked up the rights to stream 11 games between weeks 4 and 16. If you already have an antenna those same games will also be broadcast on either CBS or NBC. Some of the games will only be shown on the NFL Network: week 2 (Houston Texans vs Cincinnati Bengals), week 3 (Los Angeles Rams vs San Francisco 49ers) and week 9 (Buffalo Bills vs New York Jets). Week 12 (Thanksgiving) will only be shown on the CBS, NBC and FOX. Each station gets a different game. Below you can find the complete schedule for the regular season with the detail showing where each game will be broadcast. All times are eastern. Schedule is current as of this writing (08/22/2017) but is subject to change. Thursday, December 28 – No Thursday night game. Amazon.com will offer their Prime Members ability to stream 10 NFL Thursday Night Football games for FREE. It includes the games between weeks 4 and 16 of the NFL season. List of the games can can be found below. Just another one of the great perks that come with the Amazon Prime Membership. In the previous post I went over how to setup the Android TV 7 Live Channels DVR functionality. How that we have it up and running let me fill you in on what it can and cannot do. You can record from live TV play controls by using the record button or from the EPG guide. Selecting “This single program” will start or schedule recording right away. Selecting “Entire series” will take you through few additional options where you can select the priority of this series in relation to other recordings you have scheduled as well as recording this program on all channels or only the one you selected. If you select all channels it seems to be showing “conflicts” with itself. It does not affect the operation. From here you can play and delete your recordings and find them by series and genre. Here are some more scheduled recordings added to the DVR. You can also see how you can filter what you want to see by the type of program. Here you can see the full schedule for all of your DVR recordings where you can adjust them as necessary. Let’s go over the functionality. EPG guide only shows 48 hours of data and there is no search either. You will have to browse through the EPG guide to find what you want to record. This is a major pain and since only 48 hours are shown you have to wait until your desired program is available through EPG so you can schedule it. Once you start series recording it’s automated from there on. Sports are also considered as series and you can choose what you want to record by type/league such as NFL, NHL, NBA, Soccer and others. This was one of the major reasons I wanted to record live TV. Application is very fast and there is hardly any wait while switching channels, selecting functions, scheduling, playing recorded content, etc. This is a nice change compared to Tablo which was slow pretty much everywhere. I will record the video of functionality and post on Youtube in the next couple of days. Once recording is started you have to wait until it is finished to watch it. You cannot go back to the beginning and watch while it is recording. This is the biggest problem for me for sports. I hate watching football live due to the outrageous number of commercials. On other DVR solutions I was able to start watching the game at any point this allowed me to fast forward through commercials. No such luck here. It would be great if it allowed this functionality. All approved USB tuners are single tuner only which results in a lot of conflicts. It would be nice if dual tuners or HD Homerun tuners (Connect, Extend or Prime) devices were allowed. Maybe it’s possible to connect two USB tuners… I’ll try once I get my hands on one. Overall I am very satisfied with this solution. Granted there are limitations which I hope will be resolved soon but it works great and while you are connecting couple of hardware pieces together it requires minimum tinkering to get it working. Hopefully Nvidia Shield TV will enable this support soon so more of you can take advantage of this. Android TV Live Channels OTA DVR functionality was announced in October of 2016. It is now standard on the Android TV 7 and up. Unfortunately at the time of this writing there is only one device that supports it (Asus Nexus Player) and it is now discontinued. Few weeks ago Nvidia announced the new Nvidia Shield TV which by default comes with the Android 7 operating system. System update will also be rolled out to original Shield TV owners. I don’t have the Shield myself but early reports suggested that Live Channels app is still old but according to Nvidia this will be updated shortly. I was able to pickup Asus Nexus Player when they were on the clearance at Target some time ago but I haven’t really used it much since I found it pretty clunky compared to the original Fire TV which is our primary streamer. It was collecting dust until the Live Channels DVR was announced. Right before I purchased Tablo but I was not happy with it and I ended up returning it but that is another story. Back to Live Channels DVR. Hauppauge Digital TV Tuner for Xbox One – woohoo! USB hub – so you can connect both USB tuner and external hard drive at the same time. I am using this one. USB adapter cable – Micro USB B Male to USB 2.0 A Female adapter – apparently Asus didn’t think that full size USB port is needed. This will allow you to connect the USB hub. I am using this one. Plug in the USB hub and start with attaching the external USB hard drive. Format it as internal storage and move all apps to it. Both of those steps are necessary for the DVR to work. Plug in the USB tuner into the hub. It will be recognized by the Android and it will ask you to scan for channels. Once format is complete you will need to move data to the external drive. This is necessary for DVR to work. Once data is moved let’s plug in the USB tuner. I am using Xbox One USB tuner. After few seconds “Live Channels” will be added to your apps on the home screens and you will have the option to “Scan for TV Channels“. As you can see it found 52 channels at my house. Lots of them in HD and all of them FREE! I am 37 miles away from the transmitter using RCA ANT751 antenna mounted in my attic. Next you can add some more IPTV sources from Google Store. I didn’t bother. Some welcome screens and we are all set. Now you can go into the Live Channels. You can view all channels or narrow down your selection by different categories. Programs that can be recorded are marked DVR Recordable. It shows approximately 48 hours of programming. I was forced to take the pictures with my phone since Asus Nexus Player no longer takes screenshots once you have the TV channel playing in the background (probably due to copyrights). Here they are. In the next post I am going over the Live Channels OTA DVR usage, functions, strengths and weaknesses. You can find it here.